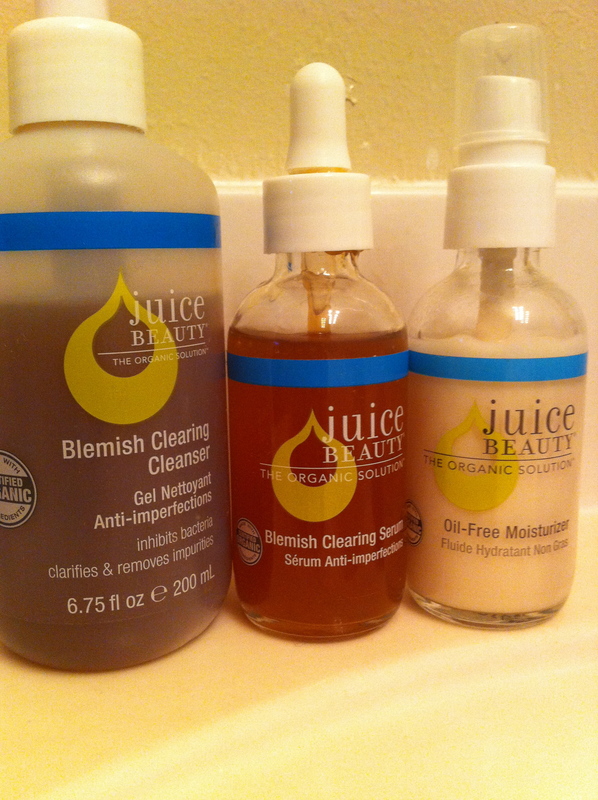 After hearing so many positive comments about Juice Beauty’s organic facial cleansers and moisturizers, I decided to give the Blemish Clearing Cleanser, Blemish Clearing Serum and Oil-Free Moisturizer a try. While I am impressed with the effectiveness of the products, I don’t think they are any more effective than many of the facial cleansers and moisturizers on the market. Admittedly, I did not follow the directions to a T. That is, I only cleansed and moisturized my face the recommended twice daily for about a week. After that, I dropped it to just once a day because it is something about the scent that does not agree with me. This is an organic product and there is definitely an earthy scent. While not altogether unpleasant, it still seemed to stay with me for a while after I cleansed my face. I sometimes thought I could actually taste it, but that may have just been my imagination. The Blemish Clearing Cleanser will get your face clean. Squeaky clean. I used it with my Clarisonic Mia and was amazed at how bright and healthy my skin appeared. Per the instructions, I followed the Blemish Clearing Cleanser with the Blemish Clearing Serum. The serum is dispensed through a dropper. I used four drops, rubbed in my palms and applied over my face and neck. I haven’t seen any change in my blemishes, though. Then again, I am not using it twice daily, as recommended. Lastly, I applied the the Oil-Free Moisturizer. The moisturizer is excellent; it dissolves into my skin leaving it very soft. Overall, I give Juice Beauty four out of five stars. It really will leave your face radiant and soft to the touch. Since I feel one should give facial products longer than one month’s use to realize the full results, I plan to continue using Juice Beauty until it runs out. I’ll post a follow-up review then. As Seen in Beauty Mags – The Clarisonic Mia! For months, I had been reading rave reviews about the Clarisonic Mia, the travel sized version of the Clarisonic sonic brush facial cleansing system. I was in interested, but after researching its price range – $124 to $150 – I quickly lost interest. However, after further research, I discovered the Mia was developed by the same minds as the Sonicare toothbrush and was sold. I have owned the Sonicare toothbrush since last November and love how clean and healthy my teeth and gums are. If the toothbrush was a good investment, the Mia couldn’t be bad. Right? Absolutely right! I purchased the lavender Clarisonic Mia from Amazon (it had the lowest price I could find) and have been cleaning my skin with it once daily for the past week. I am very pleased with the results. I have had a hate-hate relationship with my skin since my early teens. I had horrible acne and some scarring was still visible in my middle age. Since I have been using the Mia, the appearance of the scarring has diminished. Patches of dry skin that had begun to take residence above my brow line have disappeared. My skin feels smoother and is brighter. I can definitely see myself using the product every day. Clarisonic offers three types of brush heads for the Mia. They are Normal, Sensitive and Delicate. My purchase shipped with the Sensitive brush head. It also came with a trial sized version of Clarisonic’s normal to oily skin cleanser, but I have not yet tried it. Instead, I use Oil of Olay’s Foaming Face Wash for sensitive skin. Given the price of this system, I can’t recommend it for everyone. If you don’t have problem skin and just want the added cleansing benefits of a brush system, there are far less expensive products. The Oil of Olay Pro-X Advanced Cleansing System comes to mind (approximately $30 retail). But, if you have prominent skin issues like acne and scarring, then this is a good investment and you will be very pleased with the results. I will post a follow-up review after I pass the 30 day test of this product.